29mm by 12.4mm thick 18K pink gold case, diamond bezel, silvered dial, calibre 967A automatic movement with decentered hour, seconds and day/night indicator, approximately 42 hours of power reserve, 18K pink gold bracelet. Water resistant to 3 bar. 29 mm 18K pink gold case, 8.7 mm thick, sapphire crystal back, mother-of-pearl dial with black transferred numerals and 11 diamond hour markers, calibre 967A automatic movement with hours - minutes - seconds - day/night indicator, approximately 38 hours of power reserve, rose alligator leather strap, folding buckle. Water resistant to 3 bar. 29mm by 12.4mm thick 18K pink gold case, diamond bezel, silvered dial, calibre 967A automatic movement with hour, minute, seconds and day/night indicator, approximately 42 hours of power reserve, black alligator strap, pin buckle. Water resistant to 3 bar. 29 mm 18K pink gold case, 8.7 mm thick, sapphire crystal back, mother-of-pearl dial with black transferred numerals and 11 diamond hour markers, calibre 967A automatic movement with hours - minutes - seconds - day/night indicator, approximately 38 hours of power reserve, rose alligator leather strap, pin buckle. Water resistant to 3 bar. 29mm stainless steel case, diamond bezel, silvered guilloche dial, caliber 967A automatic movement hour, minute, seconds and day/night indicator, approximately 42 hours of power reserve, stainless steel bracelet. Water resistant to 3 bar. 29mm by 12.4mm thick stainless steel case, diamond bezel, silvered guilloche dial, calibre 967A automatic movement with hour, minute, seconds and day/night indicator, approximately 42 hours of power reserve, black alligator strap, folding buckle. Water resistant to 3 bar. 29 mm stainless steel case, stainless steel bezel set with 60 diamonds (approx. 0.42 carats), silver guilloché dial, caliber 967A automatic movement with minutes, hours, and day/night indicator, approximately 42 hours of power reserve, red alligator leather strap, double folding buckle. Water resistant to 3 bar. 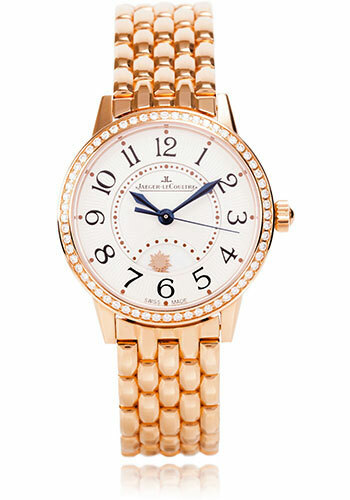 29 mm stainless steel case, 8.7 mm thick, stainless steel bezel, mother-of-pearl dial with 11 diamonds (approx. 0.02 carats), caliber 967A automatic movement with minutes, hours, seconds, and day/night indicator, approximately 42 hours of power reserve, black alligator leather strap, double folding buckle. Water resistant to 3 bar.